Along the satellites' ground track (top), the inter-spacecraft distance between them changes as the mass distribution underneath (i.e., from mountains, etc.) varies. The small changes measured by the Microwave Ranging Instrument (middle) agree well with topographic features along the orbit (bottom). 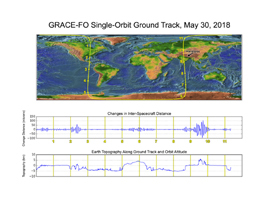 GRACE-FO continues a successful partnership between NASA and Germany's GFZ, with participation by the German Aerospace Center (DLR). JPL manages the mission for NASA's Science Mission Directorate in Washington. For more information on GRACE-FO, go to https://gracefo.jpl.nasa.gov/.